A Digital Nomad at 50? The Unemployable life is all about being a digital nomad, maybe cruising around the country in a van, trusty laptop at your side, right? Well, for the last 20 years, I can’t say that’s been my experience at all. For the next year, the family and I will be living abroad. This fall in France, a stop in Japan, then the winter in Australia (it’ll be summer there), then a hop over to New Zealand before (maybe) heading back to Europe for late spring / early summer. In reality, this trip is more about the kids (and spending time with them) than some digital nomad fantasy. But the freedom to work from anywhere certainly makes the whole thing possible. Tune in for more detail. And also find out what the future of the podcast is while I’m on this adventure. This episode of Unemployable is brought to you by FreshBooks, easy accounting software for freelancers, consultants, and anyone else who works with clients. You’ve simply got to try it for yourself with this free, unrestricted, no-obligation 30-day trial — just click here and then enter Unemployable in the “How Did You Hear About Us” section. Voiceover: Welcome to Unemployable, the show for people who can get a job, they’re just not inclined to take one, and that’s putting it gently. In addition to this podcast, thousands of freelancers and entrepreneurs get actionable advice and other valuable resources from the weekly Unemployable email newsletter. Join us by registering for our Free Profit Pillars Course or choose to sign up for the newsletter only at no charge. Simply head over to Unemployable.com, and take your business and lifestyle to the next level. That’s Unemployable.com. 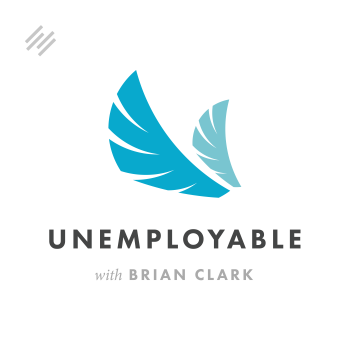 Brian Clark: Hey, hey, everyone and welcome to Unemployable. I’m your host, Brian Clark. This week’s episode is a little bit different. It’s just going to be me solo, talking to you probably pretty briefly about what’s going on in my life and why Unemployable will be going on, hopefully, a brief hiatus. It’s kind of hard to tell at this moment, as you’ll understand in a few minutes, but I want to bring you up to speed on that, talk a little bit about the Unemployable lifestyle and what that really means, and I think this provides a good example. Brian Clark: So, as I’m recording this, I am about to go jump on a plane. I’ve got some business meetings in Dallas. From there, I’m going to Houston to see friends and family. And then by the time you’re listening to this, I may well probably be on a flight with my family to Paris. The interesting thing about that is we’re not coming back. Well, we’re probably coming back eventually, but it’s not a vacation. We’ll be in Paris for a week, but then we’re going to be living in Grenoble, France for the entire fall. Grenoble is at the base of the Alps. I have been hitting the hiking trails in the Rockies pretty hard this summer to train for hiking in the Alps. The Alps are actually a lot shorter than the Rockies, but the inclines are pretty wicked, so I needed to up my game there with the hiking. Anyway, what we’re doing is spending the next year abroad, and it’s pretty cool. We’re spending almost three months in France. We’re going to hop over to Japan for about a week, check out Kyoto, Tokyo, etc., really to break up the trip to Australia, which is the next leg where we will spend our winter, their summer, on primarily the Gold Coast of Australia. I have a lot of friends in Australia, so I’m really looking forward to that two or three months, however it ends up, seeing a bunch of people on their turf instead of having them come to the States all the time. But I’m really looking forward to just hanging out on the beaches of the Gold Coast. Talk about branding. I mean, it just sounds like the perfect summer, right? From there, we’ll probably hop over to New Zealand for a period of time. Not exactly sure, and this is the cool part of this. We’ll plan the next leg of the trip while we’re in France. So, each place you go, then you choose exactly where you’re going to stay in the next place, which is a different kind of thing. Originally, we were going to spend the year in France, have the kids go to school there, get thrown into the French immersion thing. But instead we’re doing I guess what’s called “world schooling.” They’ll do their lessons online and then we’ll tie it into wherever we are geographically. The whole idea of me becoming a digital nomad is kind of a joke. This really isn’t for me, although I’m looking forward to it. It’s really the last year we could do this with the kids, even though I think they’re being good sports about it. But I think teenagers don’t really appreciate how cool it is to be able to do this kind of thing. Certainly, I didn’t have this opportunity when I was young, my wife didn’t have this opportunity. They’ll probably appreciate it when they’re 30 or so. Hopefully I stick around long enough to hear how happy they are about the whole thing. But this was really the last year, if you look at their progression and where they are in school, that we could do this. It’s really about spending time together as a family. One thing that’s become really important to me in the last few years is the kids. I mean, before I know it, they’re going to be gone. They’re going to be out of the house, they’ll be in college. It could be five years before they move back into our basement. These are the golden years to spend time with my kids. I hope I’m kidding about the moving back home, but you never know. At this point, I think I’ll miss them. I might even say, “Yeah, you know, the basement, whatever.” It depends on where that ends up being though. I think that’s part of the trip too, which is check out some other places. I do have the freedom to live anywhere, work from anywhere, so why not scout out some other locations and see where the next home base might be. Some of you may be saying, “Okay, so you sold StudioPress and now you’re going to spend a year traveling the world. It must be nice.” Interestingly, we had planned to do this even if we did not sell StudioPress. Frankly, renting out our house in Boulder and traveling from place to place so far, I’m actually saving money, which gives you an indication of how expensive Boulder has become. I’m sure it won’t maintain that way, but overall, it’s doable without collecting a bunch of money from cashing out one of our business assets. It doesn’t hurt, but it wasn’t necessary. Really I was inspired by my business partner Sonia Simone. She did this with her family a couple years ago and spent a year in Italy with her child and husband. It was just a fantastic experience. She continued to work. I plan to continue to work. But just the change in environment and having that rotate every three months or so, basically to avoid ever having to get a visa in any of these countries, you know how it goes. It’s interesting to me though, because obviously, I’m a bit older than someone who is professing to lead the digital nomad lifestyle. Again, I think that’s kind of a bit of humor on my part. This is really about spending some time together, doing something meaningful as a family. One thing I have learned compared to when I was younger, I remember right before I quit my job at the law firm and became an entrepreneur almost by default, because I didn’t have any other options. I was going to split the country and go live in Costa Rica, and if I wouldn’t have met my wife, I think I would have done that. It’s interesting — how would that have turned out? It would have been completely different, maybe, I guess, I don’t know. Fascinating to think about, but that did not happen. And so, here we are. The whole idea of being unhappy with your situation and running away some place is a pretty common fantasy. I know it was for me. But that old saying, “No matter where you go, there you are,” it’s really you that you have to deal with. Changing your location isn’t going to change anything about you. You’re carrying your own burdens or dissatisfaction with you and that’s really what you have to deal with. I think it’s been a blessing to be able to work that out through the process of entrepreneurship, of having the freedom to create stuff. We see the Instagram photos, we see the van-life hashtag, the digital nomads, the laptop on the beach. It’s all very attractive, but it’s not the thing. This is not the main reason why we do this. Now, those things may be the things that attract the dreamers. But I’m talking about the doers, the people who are actually self-employed, freelancing, consulting, entrepreneurs, what have you. It’s really about the work. Now he’s in one place, he still has incredible freedom. Sure, when you work for yourself, you can go to the movies on a random Tuesday, but still, that’s not the main thing. The freedom I think, at core, is the freedom to create, to make things out of nothing, to impact and to provide value for people through your own mind and your own efforts. Then everything else is just icing on the cake. Yes, you can travel the world. Yes, you can go see that movie whenever you want to. Yes, you can spend more time with your kids than a person with an office job. That’s all beautiful. I still think the freedom to do the kind of work that you want is the core thing. It’s got to be the thing that makes you happy or the other things will not fix that. Wherever you go, there you are. All right, everyone. The hiatus is because I don’t know what the Internet and acoustic situation will be on the road. I’m going to take the mic and I’m thinking the Internet situation is fine, because of course, we pick locations that allow Daddy to keep working. In Europe in general, in France, the rooms tend to be pretty small, so the acoustics may not be bad. What I’m saying is I want to make sure the audio quality is there to resume the show. If it is, then I’ll be back in not too long from now. But I will keep you updated, of course, by the Unemployable newsletter. If you’re not on board with the newsletter, I am doing a lot more writing. We’ve got other contributors writing stuff for Unemployable.com. So, go to Unemployable.com and sign up for the newsletter if you’re not on it yet, because there’s going to be a lot of extra stuff in addition to when the podcast resumes again. All right, that’s basically the story. I’ll be posting lots of photos on Instagram. I’ll put that in the newsletter, so you can click over there and check it out. This is pretty exciting. It is. I’m kind of at a loss for words. I’ve felt really normal about this whole thing all summer trying to work up to getting out of here. The last week has been a scramble. Even though we’re leasing out our house furnished, all the hidden stuff that we have to put in storage, there’s so much of it. I want to throw it all away, but my wife won’t let me. Hopefully, she’s not listening. I’m going to go ahead and wrap this up, get rolling. I would like to thank FreshBooks. They have supported this show for at least the last year. It’s really cool patronage. Our model has never been one of sponsorship. We produce content in order to sell you products and services, the good content marketers that we are. Having a sponsor is a new thing, but it’s been nothing but enjoyable with FreshBooks. If you are looking at an accounting solution or you’re just really struggling with all the paperwork and crap and you know, it’s the least fun of a client-based business for sure. Go give it a shot. It’s a free trial, no credit card, no obligation, but it really gives you a chance to test drive this from the ground up redesign they did. They’re adding more features to make it more inclusive, good stuff. Just head over to Freshbooks.com/unemployable, and of course, tell them I sent you over there. Brian Clark: All right, everyone. I guess my main point here is the perks of the Unemployable lifestyle are many and I would never try to downplay that too much, because I’m just about to go and enjoy them for the next year. But it’s not the main thing. It really isn’t. Be careful about the grass is always greener, but you know where you’re headed. You know what’s going to provide you your next level of satisfaction on the journey you’re on. It really is as simple as keep going. Talk to you all soon. I’ll let you know how it’s going. Again, sign up for the newsletter. I’ll keep you updated. Thanks for everything. I appreciate each and every one of you who listens to the show. Brian Clark is a writer, traveler, and entrepreneur. He's the founder of Copyblogger, editor of Further and host of Unemployable. Copyright © 2019 Tangible Digital LLC.